UNIGINE provides various samples on working with content: you can check how to use the built-in UNIGINE objects with different settings, set up LODs and materials, adjust rendering settings, or work with vegetation. 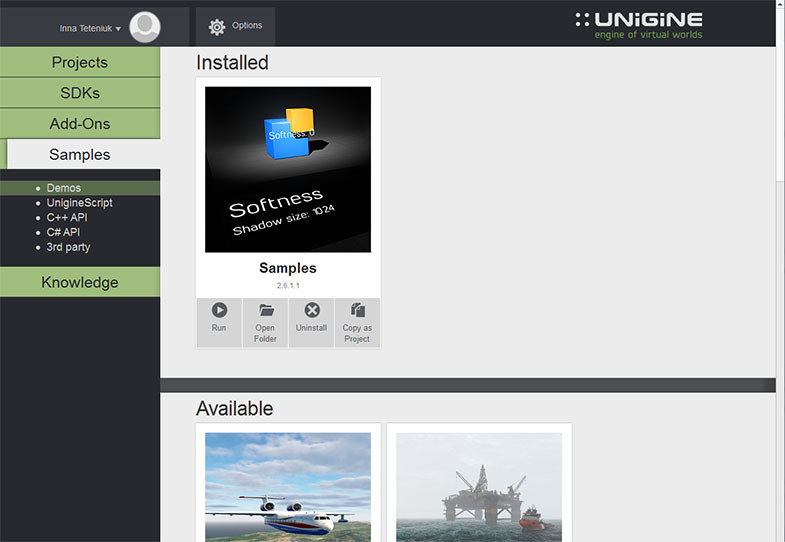 Samples are available via UNIGINE SDK Browser as a demo: go to Samples -> Demos and install the Samples demo. Then, you can run it for demonstration or copy it as a project to modify the samples. Billboards: settings, billboards generator usage. Cloud Layer: cloud material settings, usage of a field weather. Mesh Clutter: settings, masking, orienting along the relief, meshes scattered across a terrain, WorldClutter settings. Decals: use cases, decal material settings, decal types. Lighting: types of light sources, LightOmni settings, LightProj settings, types of reflections, screen space reflections. Particle systems: composing, additional forces influencing particles, particles material settings, types of particles, types of emitters. Global water: material settings, usage of a field shoreline. LOD system: LODs surfaces, performance. Materials: hierarchy and inheritance, usage of the mesh_base material, types of normal mapping, vertex color options. Natures: forest, types of vegetation, types of leaves, leaves animation, tree composition.